I admit, I'm proud of our Family news page -- the Faughnan-Lagace Herald. It was first launched around 1998 or so and is still edited in FrontPage 98 (the last good version, it will die when my XP box goes). There have been about four major revisions, but the core table layout has been pretty stable for at least 8 years. It worked when our monitor were 640x480, and it works at 1600x1200. The actual links haven't changed that much. The New York Times and BBC, for example, don't break their URLs very often. In addition to the news and functional links (stamps, refuse) there are a few of interest. There's a link to my custom searches (love 'em) and my under-appreciated JFPost.ng hack (I tag usenet messages with a unique string, then find all my messages through a simple search. I did this first with DejaNews, but it works just as well with Google Groups. Good way to find responses.). Which brings me to the latest development. 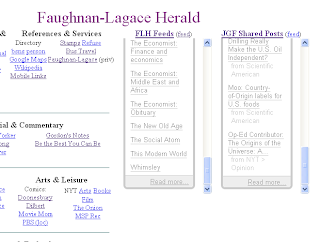 Four years ago, for the third edition of the Faughnan-Lagace Herald, I integrated my Bloglines blogroll into this page by first instantiating the blogroll in a hidden page, then embedding that page in an IFRAME. It worked very well; within the fixed IFRAME window the blogroll was a good match to the page. There are a few moving parts here, but if you look at the page source and my 2004 post you ought to be able to figure out how it works (see also the two hidden pages: blogroll.html and google_share.html). Creating the blogroll for this page: Google Reader feeds can belong to multiple categories/tags/lists/folders. In addition to the organization I use for reading my feeds, I created FLN for those I show here. GR provides various search and tagging tools to make this quick and easy. Blogroll Link to the dynamic web page expanded view: Manage Subscriptions Folders and Tags. Shared Post link to the dynamic web page expanded view: Click on your shared items folder, you'll see a link that says something like "at this web page". Shared Post feed: View the dynamic web page (as above) in Firefox. Click on the Feed icon. You'll get a page that includes the atom feed URL.